Helen Kinsella argues that it is through the capacity to sleep—the dreams and nightmares it occasions, its relation to the body and to the soul, its interruptions by trauma and sometimes its failure to be interrupted by conscience, its categorization as a military logistic, and its manipulation as a weapon—that we can further apprehend the vastitude of war. 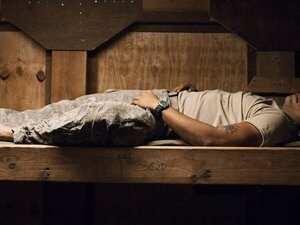 Night raids, a fundamental element of counterinsurgency, ensure that no one, combatant or civilian, may find a haven in sleep. Drones may suggest a geographical distance, but the information on their targets comes from constant and immediate surveillance of individuals in every manifestation of daily life and a strike can take place within minutes. Kinsella (parent ’20) is associate professor at the Department of Political Science, University of Minnesota, Twin Cities. She is author of the award-winning book, The Image Before the Weapon: A Critical History of the Distinction Between Combatant and Civilian (Cornell UP, April 2011) and is widely published in numerous journals and volumes. She holds a PhD in political science and an MA in public policy at the University of Minnesota, Twin Cities, and a BA in political science and gender studies at Bryn Mawr College.